As a teenager growing up in Missouri, Rowan “Rowe” Ward was on the fast track to prison. The middle child in a family of three sons, Rowe found it all too easy to escape the notice of working-class parents who spent more time trying to make ends meet than raising their sons. By the age of 8, he’d tried his first cigarette and by 12, he’d had his first beer. School was boring and couldn’t hold his attention, so he was prone to acting out or skipping entirely. That’s not to say that he wasn’t incredibly intelligent. He just had no interest in trying, particularly when his older brother, Patrick, was already making high grades. He developed a considerable juvenile record that consisted largely of petty theft, destruction of property, and disorderly conduct. At 16, he and his best friend Michael stole a car as a joke. His friend wrecked the car and died in the crash. Mike had been driving at the time. Rowe escaped without being caught and suffered only light cuts and bruises. Following the death of his friend, Rowe became more withdrawn and fell into drugs, with a preference for prescription painkillers. He got into more fights and was on the verge of joining a gang. It was only during one summer when his parents, desperate and lost as to how to stop his descent into self-destruction, sent him for the summer to his paternal grandfather in Colorado. Out in the middle of nowhere, Rowe finally got clean and took a hard look at the abyss he was heading for. With some tough love from his grandfather, Rowe decided to join the army after getting out of high school. He knew that he just couldn’t do college and he needed the hard discipline to help channel his more destructive and devious impulses. After surviving basic training, Rowe joined his squad, which also consisted of Lucas Vallois and Ashton “Snow” Frost. He was instantly drawn to the two men. He loved and admired Lucas for his tight control and natural leadership. He loved Snow for his irreverent sense of humor and hidden depth for compassion. They were stationed in Germany for most of their four years together with occasional deployments to Bosnia and Afghanistan. When Lucas and Snow left the Army in 1999 at the close of their four-year tour, Rowe was hurt to see them leaving but understood that it wasn’t the preferred fit for them. Rowe, on the other hand, needed the discipline and the promise of danger he found in the Army. Rowe completed Ranger training after their departure and continued for another three years before he was injured while on assignment in Iraq. A bullet clipped his heart, destroying a valve and ripping the aorta stem. The valve and stem were replaced in 2003, but it meant that he was permanently discharged from the Army. He returned home to Missouri to recover. But he couldn’t stay. Rowe was at loose ends. He had planned to spend his life in the Army. Now he didn’t know what to do with himself. Many old friends were contacting him again and he was afraid of sliding back into his old habits. Out of desperation, Rowe reached out to Lucas. At the insistence of his friends, Rowe joined his friends on the East Coast, where he started working as a bouncer. He found that he had a natural aptitude for spotting danger and controlling volatile situations. While his new line of work put him back into touch with the seedier side of life, coming home to his two friends kept him mostly out of trouble. Snow… was not a big help. The soon-to-be doctor tended to be emotionally unbalanced and was very good at finding trouble. Even Lucas at times would stray off the straight and narrow, and Rowe was only too happy to tag along. The trio moved to Cincinnati in 2007 when Snow began his residence with UCMC. After three years working bars, Rowe had begun toying with the idea of starting his own security business and the lower cost of living in Cincinnati was a big enticement. With the help from Lucas, Rowe founded Ward Security in 2009 and has had a hand in recruiting every person who works for him. Rowe credits his grandfather and the Army for saving his life the first time. Lucas and Snow saved him from falling back to his old ways. He loves Melissa completely. They are amazingly similar – the same twisted sense of humor, the lack of a filter and a somewhat in-your-face personality. I can’t wait for you to meet Rowe. He certainly knows how to hold his own with Lucas and Snow. 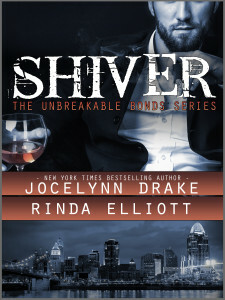 Don’t forget to pre-order your copy of Shiver so you won’t miss a second of the adventure. You can pre-order your copy now for Kindle, Nook, Kobo or Apple. We’ll have more information about a print version very soon. Shiver will be out on October 27.